-I continued to work alongside my young, maturing daughters and my mother and son have helped at several parties too. It doesn’t get much better than that! - We helped raise thousands of dollars for worthy causes. I don’t have an exact figure, but I am humbled by the amazing work of so many local and global organizations! 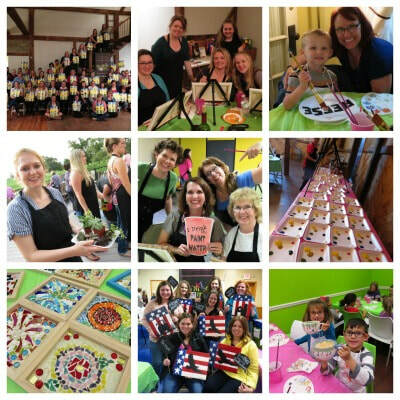 -Party hosts are the glue of Painting Parties by Judy. I couldn’t do any of this without them. THANK YOU HOSTS. I love having twice a year free parties for them!! - We tried some new projects: Succulent Planters, Mosaics, Birdhouse Gourds, Mini Parties, and Ceramics. -Kids parties and “Child & You” events continue to grow and completely WOW me. I love, love, love to work with kids and provide outlets for them to use their creativity. Seeing parents creating with their kids is also one of those “yes” moments! We couldn’t do it without Sweet Frog in Burnham!! - I left behind “searching other painting party sites.” Although I continue to deal with insecurity, I no longer search out what others are doing and rather focus on my own talents and ideas. I pray for other artist instructors in our area and pray that their businesses succeed too. - Without each one of you…this past year would have been nothing. Thank you for joining me, for your kind words, and for coming back to events. May you be blessed and realize you have been created and are loved and valued by Jesus Christ, the great artist and creator of all. - I look forward to learning, growing, and trying new things. Let’s do amazing art together in 2018! !